Release Date: 17th March 2014 (DVD). Length: 2 hours 26 minutes. Storyline: After their victory in the previous film, Katniss and Peeta are dragged back into the world of the Hunger Games while rebellion begins to sweep the Districts. Producer: Suzanne Collins, Joseph Drake, Louise Rosner, Alli Shearmur, Nina Jacobson, Jon Kilik, Aldric La’auili Porter, Michael Paseornek. Written By: Simon Beaufoy, Michael Arndt, Suzanne Collins (novel Catching Fire). There is real tension throughout the film, and the performances really bring Panem to life. There are also some moments that will bring tears to your eyes. Some viewers might prefer that less time is spent on intrigue and the rebellion before the more action-packed second half of the film, and it’s difficult to care about the love triangle. Catching Fire starts out with Katniss and Peeta preparing to go on their Victory Tour through the Districts of Panem. Events rapidly escalate out of control with the news that their daring gesture, and the reason they won the Hunger Games, has turned them into figures of hope for the people of Panem and inspired a rebellion. Katniss struggles to navigate the politics and emotions of the Victory Tour while fighting to stop the increasing tyranny of the Capitol from destroying District Twelve. Then the Quarter Quell is announced, and things get even worse for the victors. It’s difficult to get invested in this film if you haven’t seen The Hunger Games, so go watch it before buying this DVD. Catching Fire does a good job of getting anyone who hasn’t seen the first film up to speed, but the experience is overall better if you can just pick up the story where it left off at the end of The Hunger Games. The plot is fairly uncomplicated if you’re familiar with the world of Panem, although there are some aspects to President Snow’s political manoeuvring that feel redundant at best. The Games are of course a central focus, but Lawrence (the director) takes a balanced approach and spends the first hour showing the context of the Games and the way life is in Panem. The fact that it is well-written is a big part of this achieving this balance, and you will quickly become invested in the world of the movie. As adaptations go, Catching Fire certainly does the book justice without making the mistake that The Hunger Games did by assuming that all viewers had read it. There is also real focus on the characters’ relationships, which adds depth. The love triangle aspect is the biggest problem with this movie. It is difficult not to root for Peeta, who has loved Katniss from afar since childhood and was willing to die with her in the first Games. In this movie, Peeta is compassionate, smart, and incredibly brave; yet the director persists on bringing focus back to her friend Gale back home, who also holds a torch for her but really has nothing to do with the movie’s plot after the first half. The love triangle was done with greater nuance in the books, and was therefore more interesting, but in the film it feels shoehorned in. Catching Fire has some great performances. Jennifer Lawrence is fantastic as Katniss, a girl who is hardened by necessity and a real warrior. Josh Hutcherson breathes life into Peeta, dodging the dangerous possibility of Peeta becoming cloyingly nice by bringing humour and self assurance to the role. Woody Harrelson and Donald Sutherland are respectively earthy and chilling, and Elizabeth Banks turns Effie Trinket, who should be unbearable, into a surprisingly good-hearted and likeable character. Liam Hemsworth also shines as Gale, and makes the viewer want to get to know the character a little better outside of his stock “love interest” role. The special effects in Catching Fire are a reason to watch by themselves, and overall the movie is fantastic visually. From the opulent Capitol to Effie Trinket’s… interesting makeup, it’s difficult to take your eyes off of this film. It’s clear that no expense was spared, and Panem is a magnificent spectacle. The crowning glory by far is the effects in the arena, which mix horror with some really beautiful scenery. If you enjoyed the book, go get this DVD. 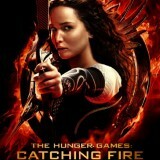 If you didn’t read it but did enjoy The Hunger Games, go get this DVD. If you are looking for an adult drama about war and dystopia, this might not be the best choice for you, but it is still great fun to watch. Find the most competitive price for The Hunger Games: Catching Fire in the table below. If viewing from a mobile device please click on + to get more information.